My imagination is working overtime. One minute, I am a dervish whirling through this surreal land in my long white skirt and brown hat. I am barely a speck in the universe. My arms seem to propel themselves toward the heavens, and I open them up to receive grace from God above. The next minute, I pull into a parking space in Goreme and suddenly I am Wilma Flintstone, Fred’s wife. My cave house is up ahead in that group of fairy chimneys with the mushroom caps. It was formed by the forces of nature millions of years ago. My local city is underground and overrun with tourists. This is where Christians hid from their Arab invaders in the 10th through 12th centuries. Inside are churches that were decorated by Byzantine monks, and stables, kitchens, fireplaces, banquet halls, and wine cellars that at one time served 20,000 residents. I duck as flocks of pigeons fly overhead, departing in formation from their nesting areas in the craggy pinnacles and fairy chimneys. 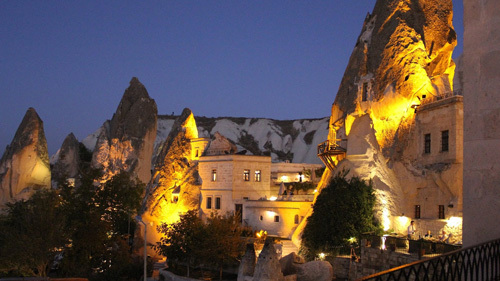 I am in Cappadocia in central Anatolia, Turkey. This large 7,700 square-mile area encompasses four neighboring provinces and was formed from the ash and lava created three million years ago by volcanic eruptions. Over the ages, wind, rain, and man have transformed the land into what we see today. My day trip starts early in the morning with a transfer from my hotel in Istanbul to the airport where I catch a short flight to Nevsehir. The plane is filled with excited travelers, many of them planning to stay for a few days in one of the cave hotels, taste some local food and wine, and hike in this dramatic landscape. Some are eagerly anticipating a balloon flight, one of the more popular activities available, and for good reason. It is said that this is the best place in the world to take a balloon ride. Others are planning to go horseback riding or rent an ATV and traverse the hills, valleys, and dirt roads stretching for miles in every direction. There’s something awesome here for everyone. My tour guide is Zeki; he and I have only seven hours together and will be looking for more sedate activities. Zeki is a good guide. He lives with his wife and young son in Nevsehir and has a master’s degree in archaeology and history from the university, a perfect background for his job. 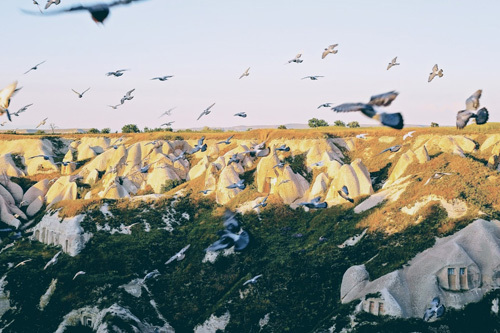 We get into the car and head down a winding roadway to start our tour at one of the most spectacular and famous landmarks in Cappadocia, the UNESCO-listed Goreme Open Air Museum. Here you can enjoy both the breathtaking beauty of nature and the study of ancient history. Fairy chimneys, also called hoodoos or tent rocks, are scattered throughout the museum grounds. These are several stories high and have a base that looks like a tent with a top that resembles a mushroom cap. Formed from the erosion of layers of soft rock topped by harder rock that erodes less easily, they look a little like gigantic cookie jars. Historically, they have been used as cave houses and churches, and today, as hotels and restaurants. 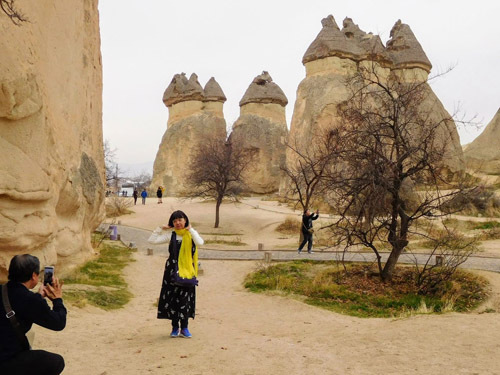 Fairy chimneys in other parts of Cappadocia may look very different, depending on environmental factors and the type of rock from which they are formed. For example, in Love Valley, they are phallic shaped, and in Imagination Valley, they look like animals. 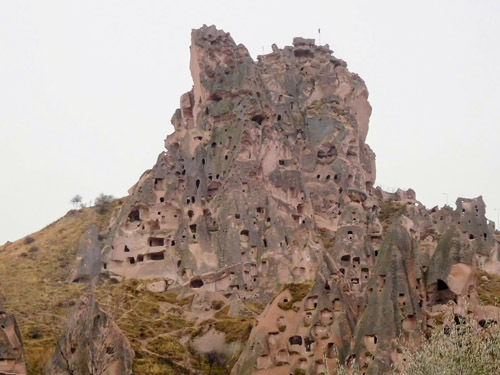 Eleven cave churches have been clearly identified here in Goreme—the Old Church, the New Church, the Church of the Sandals (i.e., footprints), the Snake Church, the Apple Church, and so on. They all have a Maltese cross over the doorway and 11th century frescoes narrating scenes from the Bible inside. The Dark Church is the most famous because it has some of the best frescoes in all of Cappadocia. The entrance is through a narrow winding tunnel which opens up into the narthex. When it was discovered in the 1950’s, layers of pigeon droppings covered the walls. It took fourteen years to clean them and underneath were found the exquisite paintings, miraculously preserved by the feces. Included are scenes of the Journey to Bethlehem, the Nativity, the Last Supper, the Crucifixion, and others. 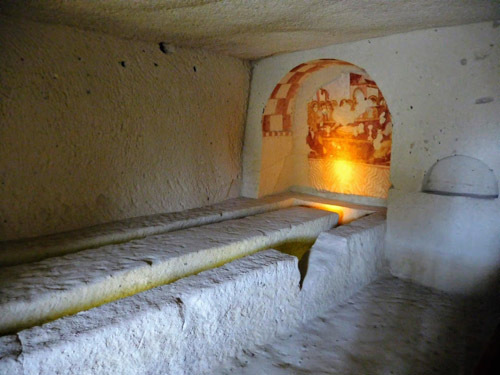 Cappadocia’s underground cities with their labyrinths of secret tunnels and underground passages several stories below ground were built centuries ago. Evidence suggests settlements as far back as the ancient Hellenic and Hittite empires. During the Byzantine period, these were monastic communities inhabited by monks and Christian refugees who were hiding from Arab invaders. We visit a community, silent today except for the tourists. At one time it was thriving and busy with people going to church or tending the graveyard, stables, storage rooms, kitchens, fireplaces, wine cellars, and dining halls. Large millstone doors were used to close off the tunnels and provide protection against intruders. Zeki and I leave Goreme and move on to tour other parts of Cappadocia. Our first stop is to visit the “zoo” in Devrent Valley, also called Imagination Valley. Over the years, the fairy chimneys in this area have been chiseled and carved by nature to look like animals. Sitting in a fenced area near the road is a large two-humped “camel”. And if you use your imagination and look closely, you will find snakes, seals, dolphins, lions, and maybe even a dragon. Children of all ages enjoy this much beloved tourist attraction. Pigeon Valley is named for the pigeon houses carved into the cliffs. Pigeons are natural cliff dwellers and years ago were an important source of food, highly prized for their protein and fat. They also were used to carry messages from this remote region, and their droppings were collected to fertilize the vineyards. Farmers coaxed them into the area by feeding them well and providing shelter, and they never left. Here in Pigeon Valley, you will encounter thousands of the little creatures flying in and out of their houses. There are times when entire flocks take flight and it is best to find cover when they do. On the Cavusin road next to the Aussie bar is a place where you can buy a special souvenir of your trip. It is the famous evil eye talisman tree. In the bazaars of Istanbul, I saw many of these blue, white, and aqua glass discs called “evil eyes”. They are used to ward off people who are greedy, envious, or have ill-will towards others. Hanging from the tree’s bare branches are hundreds of the blue glass beads. I buy one and am protected. Supposedly bad energy will be directed toward the amulet and it will break, thus warding off evil. Five kilometers from Goreme on the Nevsehir-Goreme road is Uchisar Castle, a former lookout post used as an important defense against invasions during Roman and Byzantine periods. It is set on the highest point in Cappadocia and is an easy climb to the top from which there are panoramic views of the area. The caves on the way up are now abandoned because, due to erosion, their roofs were collapsing. Pigeons nest here and sometimes there are so many that authorities have to close the path to the top. 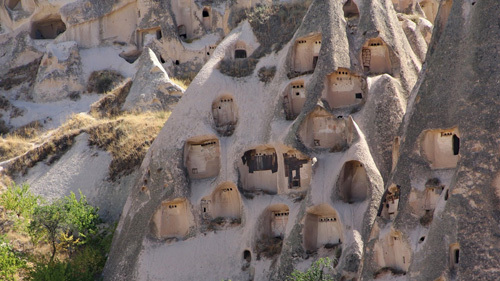 Today, some of Cappadocia’s caves are inhabited by locals who have made them into homes or businesses for themselves. I am standing on a hill and see an occupied cave below where a family has spread a tarp to dry herbal tea leaves they have collected in the area. Nearby under the stone roof is a living room with a lounge chair and TV. Down the road is a boutique hotel and a restaurant carved into the lunar-like landscape. I stop to have a pottery kebab for dinner and experience a little of the local cuisine and culture. 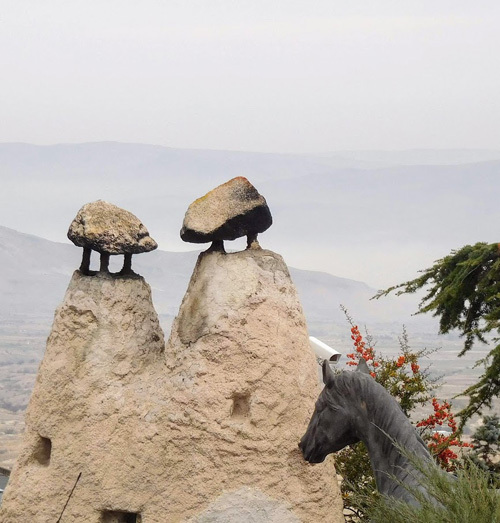 Since ancient times, the town of Avanos has been known for its pottery making. This art form dates back to the 14th century BC when Hittites made clay vessels for everyday use. The pottery is made from red soils and loam brought into the area by the Kizilirmak (the Red River) and is known internationally. Tourists provide a big market for the handmade ceramic pieces. We visit Kapadokya Seramik, a family-owned and operated ceramics factory, and watch the process. A pottery master shapes the mud into a vase using his bare hands and a manual stone spinning wheel, a job that requires immense stamina, coordination, and skill. Then the design is transferred to the piece and painted. This involves great precision and attention to detail. The final product is a work of art that will last for years. All 45 workers at Kapadokya Seramik are members of the same family, each contributing their particular skill to the process. Cappadocia is also one of the biggest carpet weaving areas of Turkey. 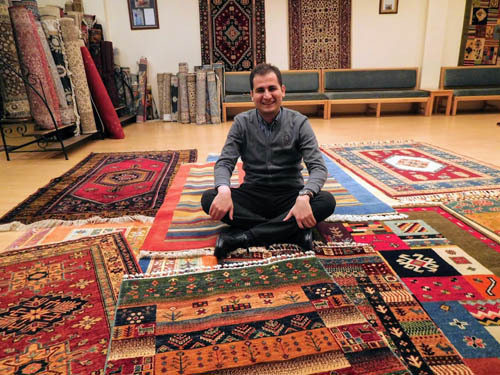 I take a tour of Sentez Avanos Hali where I am shown the process of making carpets by hand. This factory operates a school to teach young women the craft. The women tell me that their working conditions are good—they work only six hours a day and take frequent breaks to reduce eye and back strain. They love meeting visitors and showing off their skill. I am shown how silkworms make silk threads used in the process. Aylin is one of the weavers, and she picks up handfuls of the cocoons from the basin of warm water and points out the thin threads coming from them. These will later be combined to make the silk threads. Aylin offers to let me try my hand at weaving. It’s a lot more difficult than it appears to be. I end the tour with a cup of strong Turkish coffee in the showroom. Hundreds of colorful handmade carpets are displayed in front of me as enthusiastic salesmen try to get me to part with some Turkish lira. About the author: Elizabeth von Pier loves to travel. After she retired from her lifetime career in banking, she has been traveling the world, photographing, and writing. She has been published in the Los Angeles Times, In the Know Traveler, Go Nomad, Wave Journey, Hackwriters, Travelmag—The Independent Spirit, and Travel Thru History. She also has recently published her first book, “Where to Find Peace and Quiet in London”. Ms. von Pier lives in Hingham, MA.